"Fuel savings do not go unnoticed," says Wilson Contractors Managing Director, Tony Wilson. "Whilst our existing Sumitomo Series 3 excavators have always proved very fuel efficient, the newer Sumitomo 210 Dash 5 model is actually showing a 20 percent improvement over the Series 3 and a 25 percent improvement over other machines in our fleet." 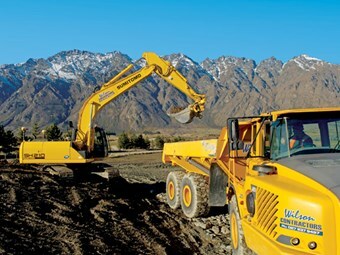 Wilson Contractors, which purchased the Sumitomo Dash 5 excavator from New Zealand distributor AB Equipment, is well known in the Queenstown area as a company that specialises in the construction of high profile developments, sub-divisions and associated works. Wilson’s is one of the main contractors currently working on the prestigious Jacks Point development. The recently completed first stage of the project includes earthworks, roading, drainage and utilities for over 100 housing lots, as well as the construction of an 18-hole international golf course and recreational lake facility. Wilson Contractors has an extensive range of services from major roading construction, trenching, bulk site excavation, landscaping, building platform, driveway and footing work; to clearing vegetation, through to the supply and delivery of all required roading aggregates and landscaping products to site. The company is committed to the utilisation of the latest technology with substantial investments into the latest satellite guidance systems. GPS controlled systems are used on excavators and graders to give the operator an "in-cab" visual display of the three dimensional position relative to the design parameters. This eliminates excessive under and over cuts, therefore ensuring Wilson completes its projects on time and within budget. The Sumitomo-5 Series excavator has been described as a very well-packaged excavator that combines exceptional performance with lower operating costs and improved operator comfort. This is achieved firstly though the introduction of the SPACE 5 Advanced Engine System, which is a powerful system specifically designed to deliver improved durability and reliability. Secondly, the SIHS (Sumitomo Intelligent Hydraulic System) is designed to improve the operator’s workload with an eight percent increase in bucket digging force, a 24 percent increase in bucket closing speed, a four percent increase in traction force and a seven percent improvement in arm closing speeds under heavy excavation, with a five percent increase in workload performance using SP (Speed Priority) mode. Operator comfort in the Sumitomo Dash 5 is a prime consideration, with improvements to every aspect of the cabin space including a larger work area, increased visibility and lower noise levels. Wilson Contractors Site Supervisor, Stephen Whiteley, is impressed with the cab comfort and at how quiet and easy the Sumitomo is to operate. "The quick and smooth control response, coupled with Sumitomo’s multi-functioning capability and overall serviceability is certainly a compelling factor," he says. Other interesting aspects of this well packaged Sumitomo Dash 5 excavator are the high performance filters keeping the hydraulic oil at its optimum, increasing hydraulic component life and providing less downtime, further reducing costs and the improved EMS (Easy Maintenance System) keeping the pins and bushes lubricated at all times, minimising wear and further extending their life. Safety is also a key part of the Sumitomo, with the inclusion of an anti-theft system as standard, as is the easier entry and exit from the cab and better access to the upper structure, which are all designed to provide the operator with more protection. 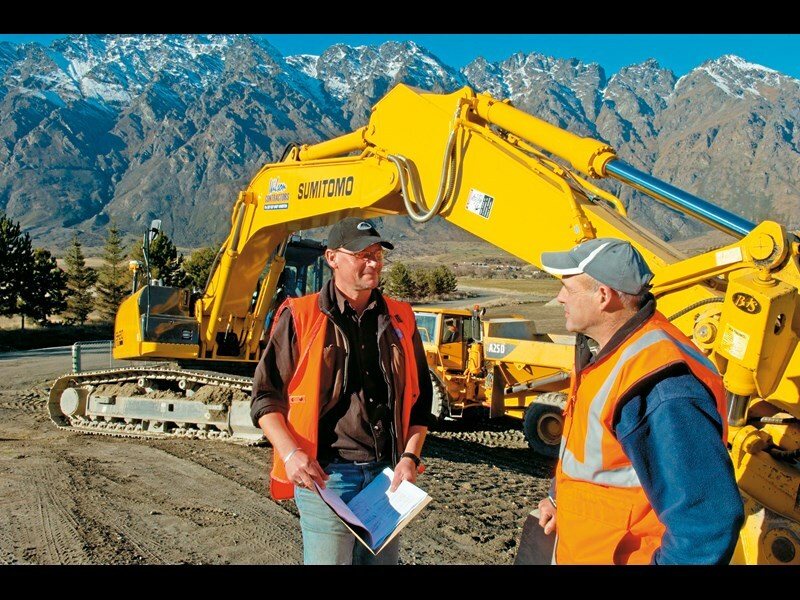 Sumitomo manufactures a range of excavators from 7500kg to 80,000kg. For more information call 0800 30 30 90 or contact AB Equipment at one of 14 branches located nationwide.